If you have ever been in an accident, had your car repaired by a body shop, and still felt something was wrong with your car, you might be right. Many cars in accidents have bent frames that were undetected or improperly repaired at that body shop. The car may not drive straight, feel crooked, or pull to one side or another. Other car owners complain the car “just doesn’t feel right anymore.” Some of the reason for this is that most body shops are not experts at frame straightening. Today, some have frame straightening services in house, but their lack of experience or lack of the right equipment produces a poor result for your car. At Imperial Auto Renewal we use the latest technology to assure your car drives like new. Every panel fits properly, like right from the factory. 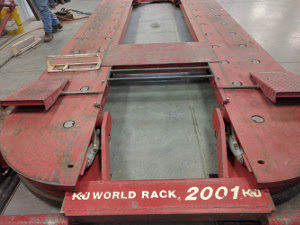 Our techs use our Kansas Jack Frame Machine equipped with the SHARK computerized measuring system to the best possible repair. This is where we differ from other body shops. Framework requires a certain amount of patience, persistence, and attention. We know and care about our customers and that's what drives us to do our best work for them consistently.